Because or their high load capability, the 57 mm Carbo AirBlocks® have an enormous working range. Use for main and jib sheets on centerboard and keelboats such as Lightning, Dragons, Solings and J/24s. 57 mm blocks are ideal for inland scows from the 16 MC to the 38' A-Scow and are perfect for catamaran mainsheets. 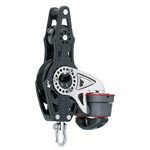 Features include the "Cam-Lock" locking system on singles and singles beckets, U-Lock on doubles and triples. The cheek block attaches easily with three (3) 3/16" (5 mm) screws. Use for: Main/Jib sheets, Spinnaker halyard, Control lines. 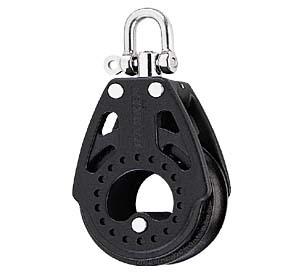 Features: Sheave diameter (in) 2 1/4; Length (in) 4 5/16; Weight w/shackle (oz.) 3.1; Shackle pin diam. (in) 3/16; Max. line diam. (in) 7/16; SWL (lb) 792; Breaking Strength (lb) 2380.